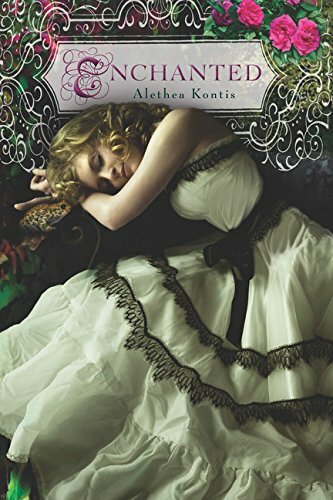 According to the author’s note, and the evidence of the plot itself, Kontis set out to write a novel with as many elements of fairy tales as possible. She seems to have succeeded…creating a plot that is a very fun ride, although at times you do have to just throw up your hands and go with it. Mostly I didn’t find that too difficult, and I was willing to roll with all the new developments. I mean, it’s an endless string of fairy tale elements. That’s fun! I have to confess I had a little more trouble with the romance and some of the characters’ choices. Sunday and Grumble the frog fall in love very, very quickly. Then when Grumble turns back into Rumbold, he doesn’t tell Sunday that he was the frog…for reasons I never quite understood. There’s bad blood between their families, he thinks she won’t love him as a prince…so he invites her to three balls, which pretty much just shoves his princeliness in her face. I don’t quite understand that decision either. And yes, of course, Sunday falls in love with Rumbold very quickly too. But, but, but–if you can suspend disbelief a bit, it is a fun ride. And very fast romances are a particular pet peeve of mine, so you might be far less bothered. Even I wasn’t bothered enough to not enjoy the book anyway. I mean, endless fairy tales references! Fun! This does look like a fun light read, even with the few criticisms you point out. I’ll have to keep my eye out for it at the library. This looks like quite a combo of fairy-tale elements. That “seven daughter of a seven daughter” reminds me of a movie trailer I’ve seen recently for a movie that’s supposed to come out this year. It was about the seventh son of a seventh son. I did get a bit confused by all the fairy tales mixed into this one. I did enjoy it, but I loved Hero by her more. Saturday is the main Woodcutter in Hero and she is my favorite. Good to hear, I have Hero on reserve at the library! Like you, I’ve had this on my to-read list (and in my now-dying Sony e-reader) for absolutely ages. I guess I really need to get it read! Hopefully before the e-reader dies! Sounds like an enjoyable “insider’s” book with all the references to the various fairy tales. It would be fun to pick up on those as you read this story. Fast romances bug me too, but they bug me substantially less when they’re in an obviously fairy tale context, since so much stuff in fairy tales happens without much (or any!) context or explanation that instantly falling in true love is pretty par for the course. I see your point…but one thing I love best about fairy tale retellings is the opportunity to add explanation (including more depth to the love stories!) that wasn’t in the original.